I started my triathlon career with two triathlon races in Heidelberg, Germany, the Heidelbergman in 2000 and 2002. The ‘Heidelbergman’ is often classified as ‘Ironman’ because of its extreme course, despite its shortened length. 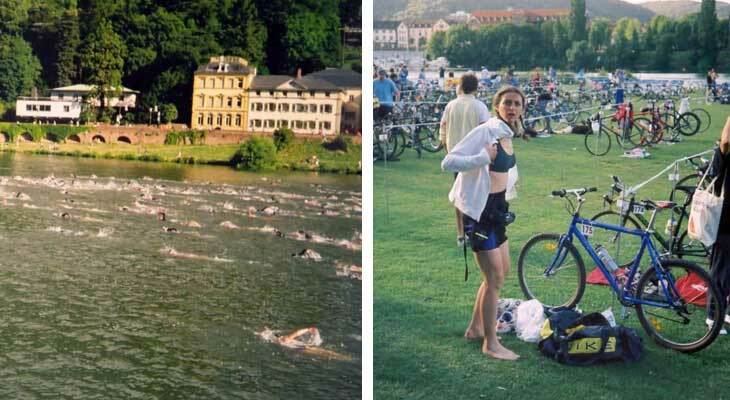 The swim takes place in the ‘Neckar’, the cycle course is a tough challenge of 800m incline to the highest point of the ‘Odenwald’, the ‘Koenigsstuhl’. The run course has got an incline of 160m on the ‘Philosophenweg’. During my time as PhD student at the European Molecular Biology Laboratory (EMBL), I lived in a beautiful historic house on ‘Karlsplatz’, right in the city centre of Heidelberg, and on the bottom of the Heidelberg castle. Every morning I cycled to EMBL on my Merida mountainbike, on the official race course of the Heidelbergman triathlon. EMBL is located in the Odenwald close to the ‘Koenigsstuhl’. But I did not only cycle to work, I actually trained for several hours on the race course before I finally cycled to work. During lunch time I usually did a training run in the forrest surrounding the laboratory and in the evening I cycled back home to city centre. All in preparation for the Heidelbergman! I also competed in the Heidelberg Halfmarathon several times in the years before to practise for the big Triathlon event.The German University Triathlon competitions were held in the course of the Heidelbergman triathlon and so this race was a good opportunity to compete with the best students in Germany. The first time I competed in the Heidelbergman, there was a strong current in the river and it was difficult to swim in a straight line. We started at the ‘Alte Bruecke’ and raced towards the ‘Neckarwiese’, where the bikes were waiting for us in the transition area. Eventhough the bike course was shortened to 35 km, it was one of the hardest courses because the cyclists had to climb over 800m in only 14km to reach the highest point of the course, the Koenigsstuhl, in the two lap course. Inclines of up to 14% alternated with downhill sections where I cycled faster than 80km/h. The roads were rough, and especially on the small ‘Kopfsteinplaster’ roads through the city centre in the beginning and the end of the course, I needed all my strength in my arms to hold my bike. The 10km run was the ultimate test for the triathlete! We started the run at the Neckarwiese, and during the first kilometre we already had to climb up the ‘Albrecht-Ueberle-Weg’ with an incline of over 10% to the ‘Philosophenweg’. In the next 5km on the Philosophenweg, we had to climb 160m. After the 5km turnaround point we had to run the same way back to the start. Then it was all downhill and I could increase my pace to maximum effort which resulted in a great running time!